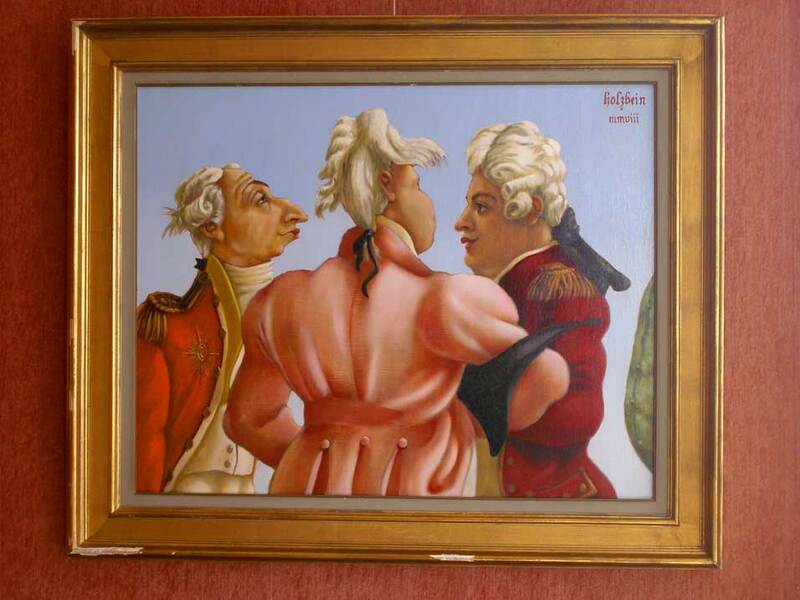 "Constructors of glass ceilings" (Holzbein 2008), after the Thomas Rowlandson sketch 'Three gentlemen of fashion'. LANTILLY, FRANCE.-British artist Horatio Holzbein has taken the top award at Lantilly 2008. The exclusive invitation only, bi-annual exhibition, which takes place in the peaceful surroundings of a French chateau, is dedicated to contemporary visual artists and sculptors working in traditional techniques. Officially, no work is traded at the weekend long exhibition as the main aim is to introduce artists and collectors with a passion for work produced using pre 20th century skills and techniques. Artists are pro-actively selected by committee and invited to give a 30 minute presentation on the inspiration, motivation and future direction of their work. Holzbein was unanimously voted best of show for his current series of paintings inspired by the work of English caricaturist Thomas Rowlandson (1756 - 1827), entitled "If Rowly had stayed in France". During his presentation, Holzbein explained that Rowlandson had received rigorous training in Paris with contemporaries of Jacques Louis David but on his return to England, was only able to earn a crust with small scale caricature drawings for a variety of publications. It was Holzbeins somewhat tongue-in-cheek contention that if he had remained in France, or indeed, found wealthier patrons in England, he would have been more likely to follow his training and apply his fluidly drawn lines to the production of life-sized figure paintings. Holzbein, who specializes in the painting techniques of the first half of the 19th century, was felt to have demonstrated his passionate belief that these could have been some of the greatest paintings - that never were - in English art history and received a standing ovation from the assembled audience for his presentation.